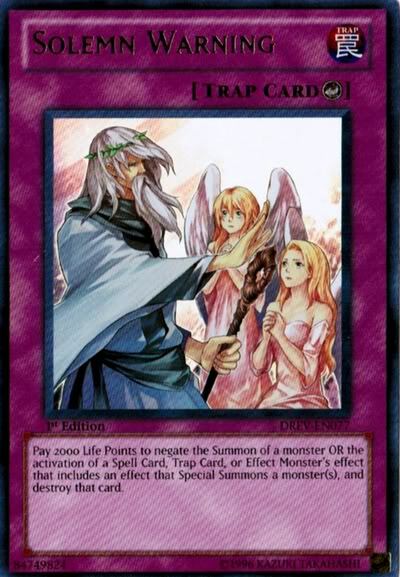 Effect: When a monster would be Summoned, OR when a Spell Card, Trap Card or Effect Monster's effect is activated that includes an effect that Special Summons a monster(s): Pay 2000 Life Points; negate the Summon OR activation, and destroy that card. * Solemn Warning can only negate cards that special summon at the beginning of its activation (ex. Monster Reborn). Cards like Valhalla, Hall of the Fallen, Fusion Gate, and Infernity Launcher DO NOT special summon a monster at activation, so Solemn Warning cannot negate, not even when they use its effect later on. *Future Fusion attempts to special summon a fusion monster later on in the duel, so it is possible to Solemn Warning. *You CANNOT Solemn Warning a monster AFTER a resolution of an effect, you must negate the card that special summons it (ex. Ritual Monster and Fusion Monster; you cannot negate the summon, you must negate polymerization or the ritual spell used). *Synchro Monster or a Semi-Nomi monster who's summon was negated by Solemn Warning cannot be Special Summoned from the grave. These are ruling/tips for people who don't understand the card, so don't make be all "yeah, we know". If I forget something or something seems confusing, please reply and I'll be sure to fix it.